place and a memorial reception will be announced at a later date. Deloraine , MB R0M 0M0 or to Bren Del Win Lodge; Box 527, Deloraine, MB R0M 0M0. 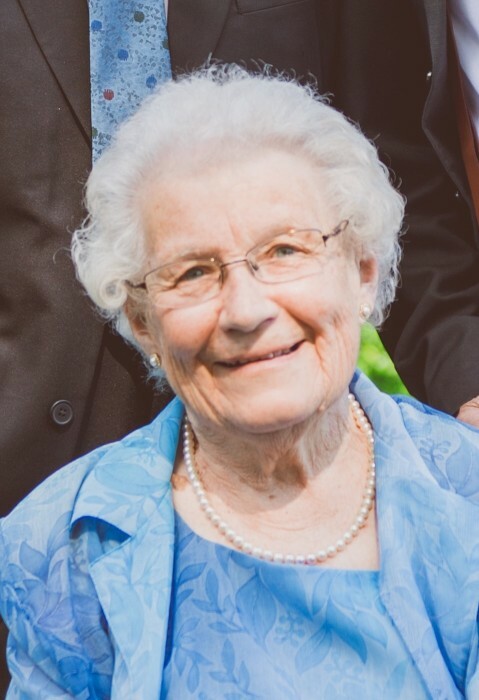 Kay Bell passed away April 9, 2019 at Bren Del Win Lodge, Deloraine, Manitoba. She is survived and greatly missed by her husband Bill; sons Brian (Helen) of Victoria, Dean (Patricia) of Deloraine and Grant (Susan) of Calgary; sister Nora Halladay (Ian) of Calgary; brother Robert Urie (Sylke) of Kincardine, ON; grandchildren Scott (Lindsay), Anika, Andrew (Shannon), Britney (Brayden), Jayson (Dani), Graeme and Brynmor and great-grandchildren Andi and Oakland. She was predeceased by sister Joan Urie. Kay was born and raised in Minnedosa, MB, the eldest of four siblings, and later moved with her family to Brandon where she worked until marrying William (Bill) Bell on Oct 5, 1957. Bill and Kay farmed the Bell homestead near Deloraine where they raised their three sons. Kay put her family first but made time for supporting her community in her gentle, quiet way. She sat on the Bren Del Win Library board and helped with the Seniors Outreach Service. She made sure her household ran smoothly so the farm could too. Kay and Bill moved to Deloraine in 1997. Kay was happiest when surrounded by family and friends and especially enjoyed square dancing, gardening, camping, baking, reading and spending time at the cabin. Donations in memory of Kay may be made to Bren Del Win Centennial Library; Box 584, Deloraine, MB R0M 0M0 or to Bren Del Win Lodge; Box 527, Deloraine, MB R0M 0M0.